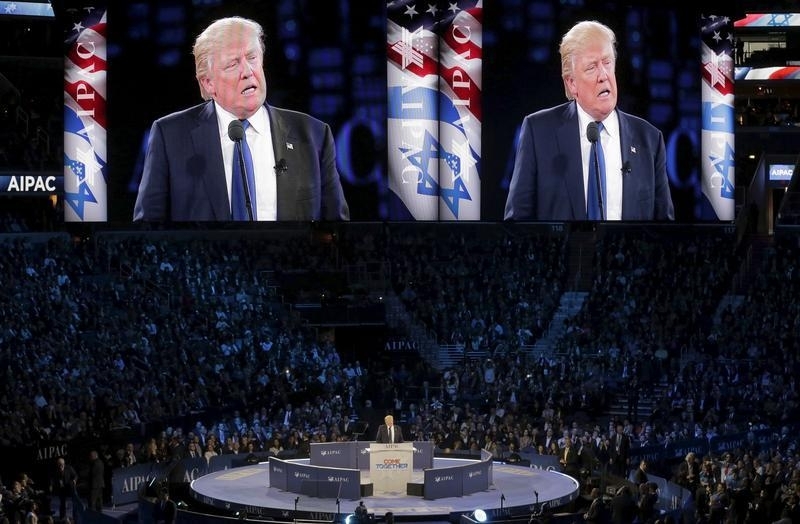 Washington - Republican Presidential candidate Donald Trump advocated for the continued building of settlements in the West Bank on Wednesday, The Daily Mail reported. In an interview with the online news purveyor, Trump refuted the notion that halted expansion of Jewish settlements is a prerequisite for peace negotiations. Contrary to the building magnate’s previous indication of neutrality on the issue of the Israeli-Palestinian conflict, Trump rejected the proposal of a halt in new construction. He asserted that Israel must continue to move forward with building projects, a position that directly contradicts that of both the Obama administration as well as the Palestinian peace-negotiating apparatus. In the past, Trump had maintained a position of neutrality on the conflict that he argued would afford him the ability to close the “deal of all deals”—a peace deal that would culminate in a two-state solution. Trump’s new stance on settlement construction comes after former Secretary of State and Democratic Presidential contender Hillary Clinton accused him of neutrality at the American Israel Public Affairs Committee’s annual policy conference in March. This could win me over. Imagine how well thought out Mr Trump is- He waits till he wins Indiana to endorse the settlements and therefore a strong recommendation of Israel (read jews- sorry all you Satmarers- But R Yoel TZL felt the same way)In order not to endanger any votes that he would have lost by changing his neutral stance..
And yes all you doubters his real stance obviously is pro settlements. Come on, Hillary. America has not been neutral under Obama y"sh. Everything Israel did was condemned. Every act of terror was viewed by the WH as militants protesting Israeli aggression - a filthy lie. You were fully aware of this, and never took a stand. Under your watch, Obama spent his "legacy" apologizing to Islam and the anti-Israel voices. Neutral? If not for Congress, Israel would have been wiped off the map. Your State Department fared no better. Finally, Trump says it like it needs to be. Stop strapping the Israelis. He knows they made overt gestures for peace, making concessions, yielding to Obama's pressures, and the Palestinians did not move at all. They do not ever talk peace, just terror. They do not follow commitments, they lie, and they kill - all with pediatric excuses that weak brains like Obama and yourself buy - for big money. You Democrats (in the Executive Branch) have been a true disgrace to American Israeli relations. Some of your partners in Congress need to go as well. Happy retirement. Hilarys stance was made clear when she kissed suha arafat y's when the witch accused Israel of poisoning pali children! All men or women running for president will promise anything no matter what party they are in to get the Jewish vote. No one be surprised when he or any other person who is running for president will change their mind. Today yes he needs your vote, tomorrow who knows??? “ Come on, Hillary. America has not been neutral under Obama y"sh. Everything Israel did was condemned. Every act of terror was viewed by the WH as militants protesting Israeli aggression - a filthy lie. You were fully aware of this, and never took a stand. Under your watch, Obama spent his "legacy" apologizing to Islam and the anti-Israel voices. Neutral? If not for Congress, Israel would have been wiped off the map. Your State Department fared no better. "Yielding to Obama's pressures" Interesting. Bush Katif was given back under President Bush. Chevron, Lebanon, Sinai etc. the same. President Obama is the first and only USA leader who didn't force Israel to give back one inch and allowed to grow the settlements and increased the $ 3 billion aid at the same time, helping building the settlements. Lets see what will happen under Trump's USA first. I hope we wont have to pay for the US help. Bush didn't force Gush Katif and was in fact taken by surprise by Sharon's plan. Sharon perpetrated the Gush Katif fiasco in order to divert attention from a family financial scandal. "Sharon perpetrated the Gush Katif.." Really. You are either too young or starting to forget the ROADMAP dictated by Pres Bush, to withdraw from Ghaza. There is no Roadmap under President Obama, only Money, Weapons etc going to Israel without any preconditions and more than ever before. "Bush didn't .." Lets don't forget that Pres Bush allowed UN 1860 condemning Israel for the Ghaza aggression to pass. President Obama vetoed every single UN vote against Israel. If Bush would be the President, today we would have a Palestinian State. As opposed to the Mrs. Arafat-kissing Hillary, ho has even worse integrity and moral clarity. Her only morals are what moves her forward and upward. She should have been in jail months ago.